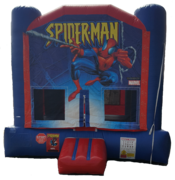 This Spider-man bouncer will be a huge hit at any super hero themed party. This is a 13x13 bounce house that can accommodate up to 6 kids at a time. Keep your kiddos busy for hours for a bouncin' good time! 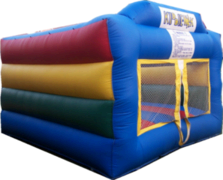 This colorful 15x15 Moonwalk unit is unisex and would be a bouncin' good time at any party! With more jumping space, this 15 x 15 unit it will accommodate more kiddos than a 13x13 unit. Keep your kiddos busy for hours for a bouncin' good time! This pretty pink and purple 13x13 bounce house is perfect for your little princess, and she will feel like the star that she is with this gem at her party! 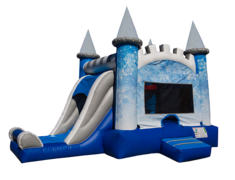 This fun princess castle will be sure to entertain any princess and her royal subjects. 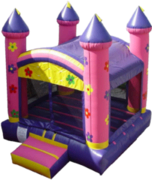 This unit is 15 x 15, so it provides a larger bounce area then our smaller princess castle. The perfect for your prince, princess or knight in shining armor. 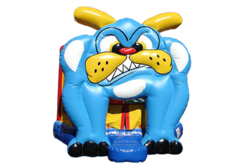 This is a 15x15 bounce which will provide plenty of fun to any party. Kids can have fun pretending to be princes and princesses for hours. 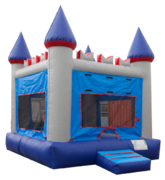 This cool gray, blue and red Medieval "King" castle is a great addition to any party, boy or girl! The 15x15 unit will accommodate more kiddos than the smaller 10x10 or 13x13 units. Keep your kiddos busy for hours for a bouncin' good time! Our BullDog bouncer is a huge hit witht he kiddos. 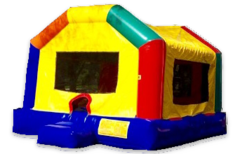 This is a 15x15 bounce house that allows 6 to 8 kiddos to bounce at once. The BullDog is the 3D which the kids love. 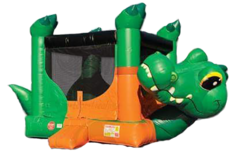 Our Crocodile bouncy house is one of our most popular units with its 3D appearance. This bouncer will surely be the talk of the town! With it's impressive 9x16' jumping area, it will keep the kiddos busy for hours! This unit is 16'Wx25'L. 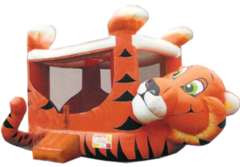 Our Tiger Belly bouncy house is one of our most popular units with its 3D appearance. This bouncer will surely be the talk of the town! With it's impressive 9x16' jumping area, it will keep the kiddos busy for hours! This unit is 16'Wx25'L. The Kiddie Walk is for TODDLERS ONLY! Ages 5 and older are not permitted on this unit. This is /a smaller unit that is great for toddlers who are a little intimidated by the bigger bouncers. This unit will also fit inside most homes or garages; perfect for the colder winter months when there is snow on the ground! This unit can only be rented with another inflatable during the summer months!